This Key web site was originally created by Alfred H. Singleman Jr. (FTB2SS) (SING) Blue Crew, Aug. 69 - Mar. 75. Al made 9 patrols on the Key, one yard period in Bremerton and was ships entertainment petty officer and ships recreation committee president. Al and his wife Diane have been together since his days on the Key. After leaving the navy Al went into the ship's modeling business. You can visit his web site at www.awards4sailing.com. Al also produces a model of the Key that you can purchase on this site at the Ship's Store. In 2002, Al, Diane and several other former shipmates formed a reunion committee that resulted in the first reunion being held in Duluth, MN in 2002. You can read more about the reunions by clicking on Past Reunions. They went on to organize the 04 and 06 reunions and the 08 reunion in New London, CT in April of 08. Al had been maintaining the site as best he could with the time he had available from its inception but the maintenance was requiring more time and expertise in web site organization and software use. A Key shipmate of Al's with some experience in web site maintenance at the 06 reunion (after a few drinks) volunteered to help maintain and improve the site. June 1, 2006 the maintenance of the Key web site was taken over by Russ Christie, MT 1 Blue Crew, 1970 - 1975. Russ made 7 patrols, 2 canal transits and 1 overhaul period in Bremerton, WA during his stay on the Key. After leaving the Key, Russ went to POMFLANT for 18 months, then was discharged. He went onto college getting a degree in meteorology and an MBA. Russ currently runs a small import company distributing specialized weather instrument to schools and businesses throughout the US. You can visit his web site at www.allivanmktg.com. There are currently over 1200 former Key shipmates on the Crew List. To be on that list, a crew member must muster on the web site and submit the form. E-mail addresses are not published but are available on request so that former shipmates can reconnect. 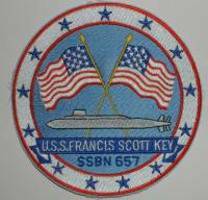 The Key web site is a resource for all former Key shipmates. You should all feel free to contribute any photos, sea stories, narrative histories, papers, souvenirs, etc that will help us build a history of the Key from the crews viewpoint. If you have a web site, we will gladly link your name on the crews list to your site. We are always open to suggestions. Please send any photos, stories, etc to Russ at ssbn657@comcast.net.